Should you Choose Financial or Industrial Owners for the Company? The key question on how to choose between financial vs. industrial investors in divestitures, ownership restructuring or capital raising, involves the handing of a set of challenging trade-offs. Here is a guide. This article is available in a full pdf version. Financial or industrial investors as new owners? This choice is a recurring theme in many M&A processes, restructurings and capital-raising projects – and the road to finding the right answer is paved with challenging dilemmas. These dilemmas have a “hard side” such as direct conflicts-of-interest between existing and new owners in start-ups or in buy-out situations, but there are also plenty of examples of more subtle types of friction; e.g., between employees or unions (who tend to prefer industrial ownership) and shareholders (who tend to prefer high valuations independent of types of owners). Occasionally, an owner preference conflict can develop into deep disagreements which require custom designed M&A processes for bridge-building between key constituencies. So let's dig into the fundamentals of the drivers, motives and characteristics of each owner type. Financial shareholders are temporary owners. They acquire ownership positions with the purpose of divesting them with a profit at a later time. This, consequently, means that they have aligned interests with more passive shareholders who also prefer a phase of high growth, value development (and risk!) followed by a resale. Due to these development characteristics, financial owners are naturally motivated for establishing win-win relationships with key employees and other shareholder groups. Consequently, many are satisfied with minority positions (e.g., in the neighborhood of 10-40+%), and they are normally positive to stock inventive programs. Passive financial investors (not being concerned with active roles or board positions) as a general guideline take smaller ownership stakes. Professional and active investors come with all types of ownership size preferences. Many private eguity groups require large majority stakes (e.g., 70%+), while others are satisfied with 35-40% stakes combined with well-defined shareholder agreements (SHAs). The primary disadvantage of financial owners is that the future ultimate owner is unknown, which may be a challenging premise for owners who have a long and emotional history with their companies. It may also create opposition among shareholders with dual roles, including that of managing operational assets (e.g., franchisees of retail chain systems) due to uncertainty of future strategy or business models. Such disharmonies may be aligned – e.g., through the implementation of legal mechanisms freezing certain business model elements, or through incentive programs including equity participation. Another disadvantage of financial owners may be differences in cultural values, which may be considered inconsistent with those of founding shareholders or key employees. Industrial owners' motives are totally different from those driving financial investors. Value development followed by a resale is usually the opposite of what they prefer. Industrial owners represent a final destination of the ownership. Their objective is to control 100% of the shares in order to optimize the integration with their own value chain; e.g., within purchasing, manufacturing, distribution channels or administrative functions. Consequently, speed and dedication to the post-merger integration process are high on the agenda. Advantages include their dedication to operational effectiveness and that the ultimate ownership is “known” at the time of the initial transaction. Despite the fact that industrial owners need full ownership for achieving value chain optimization, many industrial buyers still demand (rather ironically) multi-step acquisition models for reducing risk, which is neither consistent with the post-merger integration agenda, nor with the precondition of limited remaining value potential as a stand-alone company. In addition, multi-step acquisition models with industrial buyers have built-in conflicts-of-interest towards remaining minority shareholders because the industrial buyer ultimately wants full ownership at a lowest possible total cost. Such transaction designs therefore require special risk-reducing mechanisms for the selling shareholders, protecting against tactical behaviors in the later steps of the ownership transfer process. Financial owners: The fact that financial investors have aligned interests with existing shareholders in regard to share price development, does not mean that the relationship is without risk in general. A key point is e.g., to ensure that minority shareholders have a right to “tag” on to the sale executed by a professional financial owner (“tag-on clause”). Likewise, a group of professional investors will want to facilitate a full sale of a company (“drag-on clause”) in order to achieve a best possible price tag – which is, naturally, linked to “minimum terms” as a precondition for being enforced. Both “tag-on” and “drag-on” clauses are standard mechanisms in any shareholder agreement (SHA) with professional financial investors. Other common mechanisms in a SHA include corporate governance principles on issues such as board composition and future private placements as well as the timing and preconditions concerning a future resale of the company. 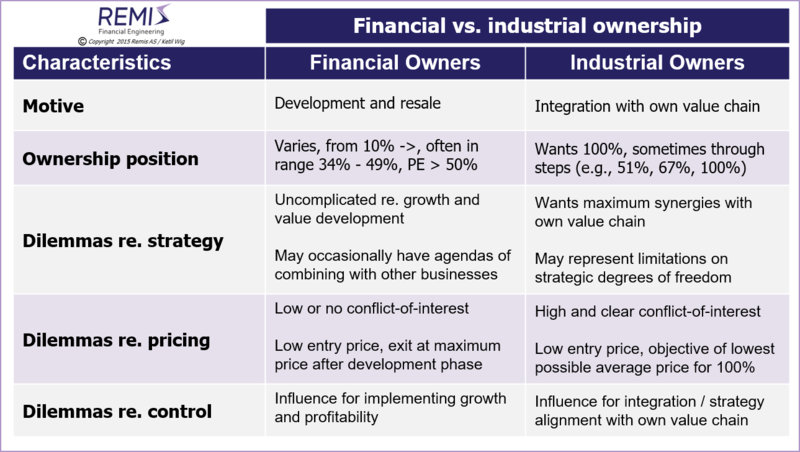 Table 1 below summarizes the key characteristics of financial vs. industrial owners along 5 dimensions: motives, preferences regarding ownership stake, and dilemmas in regard to strategy, share pricing and control. A different risk factor concerning financial investors may be a hidden motive regarding cooperation with another company (e.g., through a merger). Such uncertainties may require special protection mechanisms, e.g., in the form of agreements on future strategy and business development priorities. Industrial owners: Industrial owners have a direct conflict-of-interest with existing shareholders unless they acquire 100% initially, stemming from their motive of obtaining 100% ownership at the lowest possible average price. Consequently, price formulas and complementing risk reduction mechanisms need to be in place with cautious attention to protecting existing owners in multi-step buyout schemes with industrial owners. A related but particularly tricky situation emerges in cases where an industrial buyer acquires a significant ownership position (e.g., 35% or 51%) with an intention or a firm buy-out program in place to arrive at full ownership, but fails to execute. It does not matter whether this is formally an option or not – the full acquisition is just not completed. The consequence is, regardless of the background, that the company for all practical purposes is “unsellable” and effectively blocked from finding solutions with alternative investors – they being financial or industrial. There are a couple of alternative solutions in these types of situations. One option is a deal mechanism with a right to repurchase the shares at a discount (representing a penalty) in cases when the original intent has not been followed. Another alternative is for minority shareholders to trigger a resale of the whole company (or listing it on an exchange). For all alternatives a key issue is to use legal mechanisms that are actually immediately enforceable without spending years in legal disputes! There are situations where negotiations regarding part ownership can be initiated with both financial and industrial investors. Obviously, most traditional funding situations fit with the objective of financial investors. An illustrative situation involving an industrial investor may be a situation where a strategic alliance is being established with the purpose of gaining access to an otherwise captive distribution or sales channel – and where an equity share is part of the “package” (see this article on Strategic Alliances and Joint Ventures). Such arrangements make sense as long as the existing owners are carefully aware of the risks regarding future motives, and are paying close attention to the necessary deal mechanisms involved (ref. 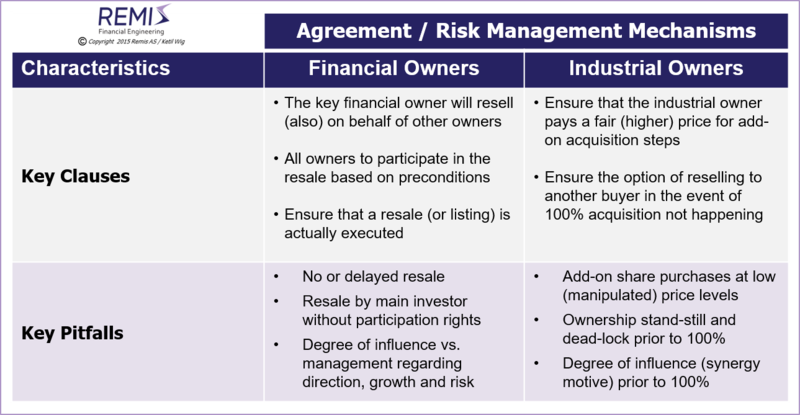 table 2 above), including the consequences of an industrial investor changing its strategy to prioritize an acquisition over a resale down the road. Occasionally such future acquisitions may be part of the original design, and this has a particular relevance in these “disruptive times” with many start-ups challenging the core business of established players. I just finished reading Brad Stone's excellent book on Amazon (“Jeff Bezos and the Age of Amazon”). Among the many and fascinating situations described my Mr. Stone is Amazon's development of the Kindle device (introduced in 2007) and the early strategy and funding discussions that Amazon had with a start-up as an alternative may of getting access to the technology around 2004. The key question is how a deal should have been structured in order to provide an upside for the founders (and other investors) as well as protecting against unfair acquisition practices once the industrial investor was on the inside. This is not covered in Mr. Stone's book, but the described situation clearly illustrates the general dilemma. Even an excellent understanding of the underlying pros and cons of financial vs. industrial ownership does not solve practical cases where price differences represent very real dilemmas. Such situations may be of both types: e.g., when the strategy (and most shareholders) favor financial ownership while an industrial buyer is willing to pay more; or the other way (and perhaps more tricky): The situations leans itself towards industrial ownership, but a financial investor offers better terms. These dilemmas may create deep internal conflicts. Their solution often lies in the design of the M&A process itself (see this article on M&A Process Management), working intimately with the different constituencies and using negotiation tactics which to the maximum extent align the strategic advantages of a certain buyer type with the offered terms. In controversial situations the ability of harmonizing the interests of constituencies and eliminating strategy vs. pricing dilemmas characterize the broader skill portfolio of a highly qualified negotiation team. For a full pdf version of this article, see White Paper #7: Should You Choose Financial or Industrial Investors/Owners?. Also read the separate article on Strategy and the Use of M&A, on Strategic Alliances and Joint Ventures, on Synergies and Poor Judgment, on Buy-Side M&A, on Sell-Side M&A, on Developing High Quality Business Models; on Equity Based Financing of Start-ups, and about M&A Process Management. See Download Center: White Paper #1: Post-Merger Integrations - About Synergies and Poor Judgment; White Paper #2: Strategy - and the Proper Use of M&A Tools; White Paper #5: Buy-Side M&A (mergers and acquisitions); or White Paper #6: Sell-Side M&A (divestitures, trade-sales and mergers); White Paper #8: Equity Based Financing of Start-ups and High Growth Situations; or White Paper #9: A 15 Step Recipe for Developing Your High-Quality Business Model. Remis AS and Ketil Wig offers financial advisory and consulting services to foreign owners, handling key priorities related to investments and operational assets in Norway. Typical corporate finance assignments are related to ownership strategies, business partner searches (e.g. for strategic alliances or joint venture solutions), valuation projects, or de-mergers/spin-offs. 20+ corporate finance projects in various industries. Focus on ownership strategies, equity splits/de-mergers, equity and debt financing, valuations, bid management, takeover protection, capital structure optimization and handling IPOs. Business unit size of UD$50-800M.